Multiple research studies have indicated that most social media sites – with Facebook being the unsurprising prime example – revolve around the content that 10 percent of its users create. The other 90 percent that engage with the platform are information consumers. This statistic is also reflected in the type of interaction experienced between Business Intelligence (BI) solutions and their user base. Over the past several years, there has been a notable shift in BI and analytics software development angled towards that broader consumer audience. Gartner has captured this shifting market demand, revealing product ‘ease-of-use’ to be the foremost criteria considered by those looking to purchase a BI tool. We agree that satisfying the needs of BI consumers – those users from non-technical backgrounds, who simply want to harness data-based insights in order to make better decisions within their specific job function – is the key to pervasive, and therefore ultimately successful, BI deployments. But whatever happened to the needs of the content creators – the power users? The 10 percent of a BI user base responsible for unearthing all that valuable fact-based knowledge. We thought about this long and hard with the recent release of Yellowfin 7 – the latest iteration of Yellowfin’s platform for reporting and analytics. Whilst our primary audience is the aforementioned data consumer, we realize that enabling people to easily create better quality BI content in short timeframes will positively impact the entire BI ecosystem. It’s that realization that drove us to completely redesign and rebuild the report authoring process from the ground up in Yellowfin 7. This change will not only make the process of creating great BI content even easier, it’s also intended to enable more people to author BI content to assist in the development of an analytic organizational culture. And besides, why should ‘ease-of-use’ simply focus on content consumers? Shouldn’t an intuitive and refreshing user experience be available to all user types? 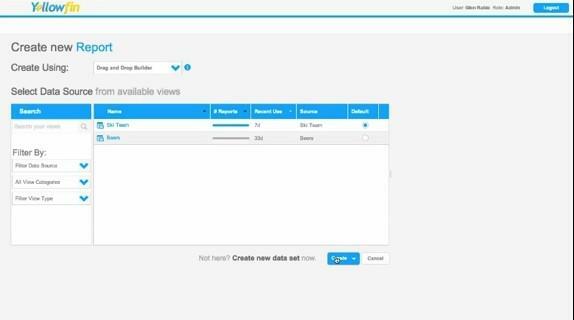 The new report builder offers users a more sophisticated Data Discovery experience, delivering report writers a completely Web-based interface that’s not only beautiful, but highly flexible and intuitive. The stunning new content creation interface in Yellowfin 7 has made the report building process much more navigable. We’ve streamlined the steps required to create content, making the entire process faster and more intuitive – more options are available in one place. For example, the first step for creating a report – where users select a data source from available views – has been restructured to make the entire process simpler. Previously, if users wanted to begin creating a report immediately, but arrived at this first stage and then realized that they hadn’t created their data source or meta-data layers, they had to take a backwards step to set it up. Now, with Yellowfin 7, there’s a button that enables you to quickly create a new data set for reporting purposes on-the-fly. 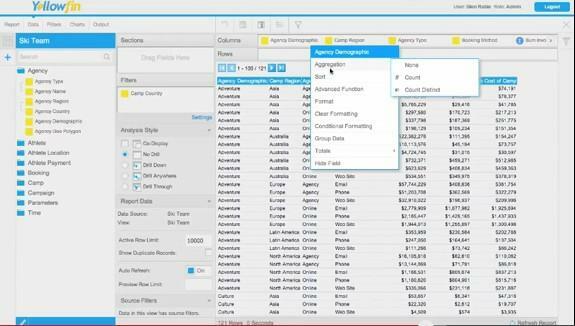 Advanced help features assist users through each step of the content creation process, with tips outlining what types of data you need to structure reports, and which columns, rows and filters you might need. Color-coded chart selection help assists users to choose appropriate visualizations to effectively display the information within the reports they’ve created. 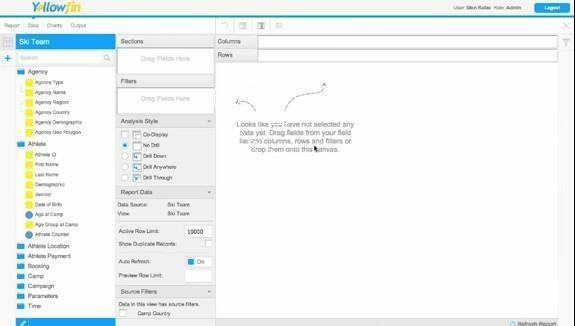 Whilst users can still drag and drop selected fields into their column, row, section and filter boxes, they can now also drag selected fields straight onto the content creation canvas. No matter the method chosen for creating a report, your selections will be instantaneously visualized on the canvas. This enables users to see the result of their actions immediately, to attain instant insight, which also enables them to understand if their selected metrics and dimensions have combined to create the desired report. Previously, users had to navigate to a separate section within the Yellowfin application to visualize this information. Yellowfin 7 allows you to attain deeper understanding, in less time, while ensuring that you always publish the most insightful reports – using the most appropriate visualizations – every time. Never publish a sub-standard report again with Yellowfin 7. Other new features include the ability to control the auto refresh feature, via the ‘on’ and ‘off’ slider, as well as row limits. The key point is that every step in the report creation process can be controlled and conducted from one place. 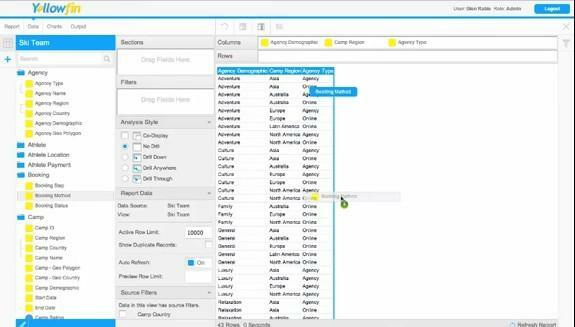 Users can apply formatting, sorting, totaling, aggregates and more in one place, with a simple click. 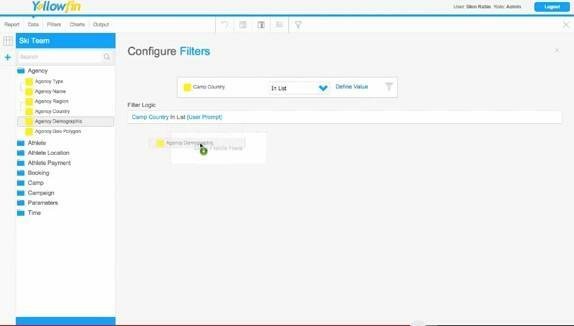 Filters can also be configured from one central location, with the visualized report updating in real-time. 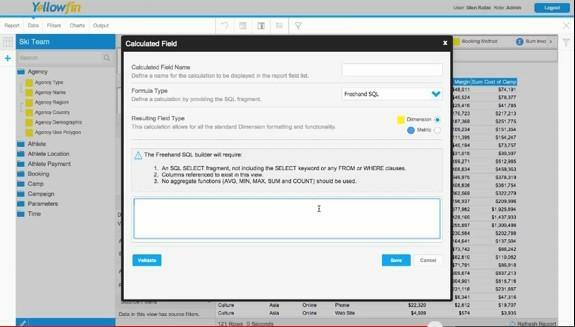 Users can even create custom calculated fields on-the-go using freehand SQL. Enhanced formatting controls make reporting content easier to distribute and configure for mass distribution, helping customers keep their content consistent with corporate styling demands. Whilst we’ve long held the opinion that Mobile BI should be angled towards the data consumer, we also understand that most BI users are device independent – swapping from a PC to a laptop, to a tablet or phone throughout the day. As such, we wanted to ensure a consistent user experience for the core Yellowfin application across all devices. The result? Yellowfin 7 offers users the flexibility to create content on their mobile device of choice, through the browser, just as they would via their desktop computer. The ability to author reports via any mobile device empowers users to explore data and discover fresh insights anywhere and anytime. This important update not only offers a seamless user experience, it enables true device independence by empowering users to conduct ad-hoc analysis whenever and wherever necessary. Yellowfin 7’s all-new report authoring capabilities allow you to create better content faster, by immediately visualizing data sections, to enable instant insight at any moment on any device. Yellowfin 7: Making Beautiful, Balanced and Brilliant Business Intelligence easy.